"The status quo is good for the big guys, but when it starts to break down, opportunity is created for small companies like mine. And fortune favors the bold. There's a lot of things that are very, very uncertain right now, but from where I sit that's a good thing." --Doug Seibold, founder of Agate Publishing, in an interview with the Chicago Reader. Amazon: Front-Lit Screen for E-Ink Kindle? TechCrunch's Devin Coldewey reported that he "was lucky enough to get a chance to see what Amazon has cooking for its next generation of e-readers." Amazon's purchase of "light-guide technology" company Oy Modilis in 2010 and subsequent developments have reached a point where "a new generation of glowing Kindles will be coming our way sometime this year." According to Coldewey, "the size appears the same, and the whole point of purchasing the light-guide company was to get the team and their patents, which essentially laminate the light diffusion layer right onto the screen without adding much in the way of depth or interfering with the touch system. I was told the industrial design isn't finished yet, but I ruled out things like ruggedness, waterproofing, or a flush-front screen--all things, by the way, I suggested they look into. It shouldn't be any thicker, though it will have to accommodate the LED circuitry and presumably a larger battery." During the next month, Third Street Books, McMinnville, Ore., is "condensing into the east side of the building and installing a partial wall to separate the two spaces," owner Sylla McClellan wrote in a store e-mail. "The empty space will be available for rent (if you are interested, please call the bookstore). We will still bring you the unique selection that you have come to expect. We also will continue to offer you excellent customer service. Our ability to special order titles quickly (often within a day or two!) will be maintained as well. And, many other things won't change either; weekly storytime, periodic author events, free gift wrapping and a smile!" McClellan cited "very real challenges in the last few years," including competition from Amazon and the economy. Still, she wrote, "I continue to believe that Third Street Books has a place in our community." The Rowman & Littlefield Publishing Group, which owns National Book Network, has bought the assets of Fairview Press. Rowman & Littlefield has been Fairview's distributor to the trade in North America since 1996. Fairview was founded in 1989 as Deaconess Press and publishes health and wellness books for the general book trade and specialty healthcare markets. It has been a division of Fairview Health Services, a healthcare provider affiliated with the University of Minnesota. 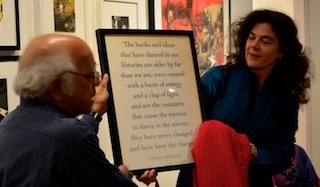 Samik Bandyopadhyay, dean of editing at the Seagull School of Publishing, and Ann Ollestad, Norwegian ambassador to India. The Seagull School of Publishing began its inaugural four-month session in Calcutta, India, on April 2 with 26 students. The first month overview of publishing includes lectures by professionals from all aspects of the publishing industry in India and abroad. The students will then split into parallel syllabi on editing and book design. The school is an initiative of the Seagull Foundation for the Arts in association with Seagull Books and supported by the Norwegian Ministry of Foreign Affairs and the Norwegian Embassy of New Delhi. Students are blogging on the Seagull School's website. 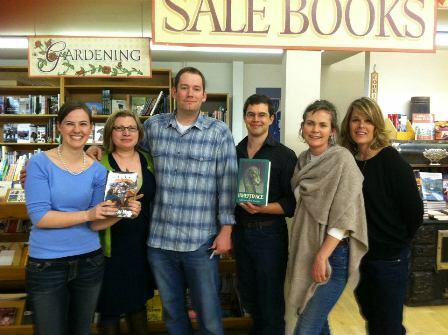 Last Thursday, Brandon Mull and Christopher Paolini, authors of the Beyonders and Inheritance series, respectively, visited the Country Bookshelf, Bozeman, Mont., for a joint presentation and book signing. An SRO crowd cheered as the fantasy mega-authors led the audience through a humor-filled fantasy world-building exercise featuring dwarf pirates and poisonous pink pandas. Posing after the event are Country Bookshelf's Heather Greer, owner Ariana Paliobagis, Mull, Paolini, Laura Prindiville and April Stuart. Post early and post often! Voting for finalists for the first Independent Book Blogger Awards, recognizing "the amazing talent in book blogging today," have begun and will run through April 23. The awards will be given in four categories--adult fiction, adult nonfiction, children's/YA and industry news--and are sponsored by Goodreads and the Association of American Publishers. Winners will be chosen by a committee of industry representatives and announced about May 8. Winners in each category receive a free trip to BEA in New York City. On Twitter, musician and Hunger Games actor Lenny Kravitz, on tour in Japan, posted: "Spent the afternoon in Daikanyama Tsutaya bookstore. One of the most beautiful stores I've ever been in. Love, Lenny"--along with a photo. Midnight Sun, Arctic Moon: Mapping the Wild Heart of Alaska by Mary Albanese (Epicenter Press). Tomorrow morning on NPR's Morning Edition: Tyler Cowen, author of An Economist Gets Lunch: New Rules for Everyday Foodies (Dutton, $26.95, 9780525952664). Tomorrow morning on the Today Show: Kelle Hampton, author of Bloom: Finding Beauty in the Unexpected (Morrow, $24.99, 9780062045034). She will also appear on Dateline. Tomorrow morning on Good Morning America: Judy Smith, author of Good Self, Bad Self: Transforming Your Worst Qualities into Your Biggest Assets (Free Press, $26, 9781451649994). Tomorrow on Glenn Beck's Radio Show: John Stossel, author of No, They Can't: Why Government Fails-But Individuals Succeed (Threshold Editions, $27, 9781451640946). Tomorrow on the View: Trisha Yearwood, author of Home Cooking with Trisha Yearwood: Stories and Recipes to Share with Family and Friends (Clarkson Potter, $29.99, 9780307465238). Tomorrow on the Tavis Smiley Show: Noam Scheiber, author of The Escape Artists: How Obama's Team Fumbled the Recovery (Simon & Schuster, $28, 9781439172407). Nominees for the 2012 Hugo Awards and the John W. Campbell Award for Best New Writer have been named. Winners will be announced September 2 at Chicon 7 in Chicago. Finalists for best novel are Among Others by Jo Walton (Tor), A Dance With Dragons by George R. R. Martin (Bantam Spectra), Deadline by Mira Grant (Orbit), Embassytown by China Miéville (Macmillan/Del Rey) and Leviathan Wakes by James S. A. Corey (Orbit). The John W. Campbell Award for Best New Writer nominees are Mur Lafferty, Stina Leicht, Karen Lord, Brad R. Torgersen and E. Lily Yu. The Innocent by David Baldacci (Grand Central, $27.99, 9780446572996) pits a ruthless hitman against his own employers after a botched job. The Presidents Club: Inside the World's Most Exclusive Fraternity by Nancy Gibbs and Michael Duffy (Simon & Schuster, $32.50, 9781439127704) explores the sometimes surprising ways modern presidents and ex-presidents interact. White Horse: A Novel by Alex Adams (Atria, $19.99, 9781451642995) is a post-apocalyptic tale of survival. Kaltenburg by Marcel Beyer, translated by Alan Bance (Houghton Mifflin Harcourt, $26, 9780151013975) focuses on an enigmatic German zoologist studying animal behavior in the aftermath of World War II. Game Over: Jerry Sandusky, Penn State, and the Culture of Silence by Bill Moushey and Bob Dvorchak (Morrow, $26.99, 9780062201133) investigates Penn State's child abuse scandal. The Farm: Rustic Recipes for a Year of Incredible Food by Ian Knauer (Houghton Mifflin Harcourt, $30, 9780547516912) serves up seasonal local food. 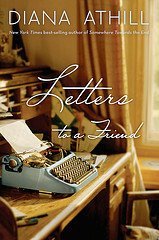 Diana Athill is perhaps best known for her memoir Somewhere Towards the End, but Letters to a Friend could eclipse it. It's a collection of letters written between 1981 and 2007 to the American poet Edward Field. Athill was first introduced to him through their mutual friendship with the eccentric American author Alfred Chester, whom she published in the 1950s and '60s as an editorial director at André Deutsch, the London publishing house, a position she held from 1952 to her retirement four decades later. Athill is now 94, happily living in an "old people's place," as she calls it. "Usually when someone's letters are published the writer is dead," Athill writes in her introduction. "In this case there was a problem: Edward is six years younger than I am.... If he waited until I was dead he might be dead too." At first Athill demurred, but Field insisted their correspondence was worthy of publication and she finally relented. Each letter is an unalloyed delight; articulate to the point of eloquence, and candid, even about the naughty bits and her frustration with her long-time lover, Barry Reckord (a Jamaican playwright now deceased). They were together for years, in a relationship so open that, at one point, Athill invited one of his girlfiends to live with them. Field shares Athill's letters with his partner of more than half a century, Neil Derrick, who lives in New York. Derrick, also a writer, was blinded by an operation for a brain tumor and he listens as Field reads each letter aloud. Athill cheerleads the couple when they decide to put their heads together and write a commercial novel, and revels in their success when they pull it off. She is in France on the occasion of Princess Di's funeral and watches every second of it, mixing her compassion for Di's boys with her contempt for the royal family. She has little sympathy for Di, writing that she was a "foolish, flighty, unhappy girl being turned into a saint just because she was pretty, and affectionate to children and sad people." She describes Di's brother, who promised that he would protect Di's boys from the royal family, as "a man whose marriage collapsed in an ugly way and who went to live in South Africa and who has, I think, the face of a bad tempered pink pig." Shelf Talker: An epistolary memoir filled with Diana Athill's wit and humor, celebrating a 30-year friendship.